The Note II comes with all the same "S" apps that were on the GSIII, as well as a number of new features for the S Pen stylus. The S Pen itself is improved. Not only is it thicker, it has a "right click" button for activating secondary features on the screen, such as menus. It slips into the Note II's bottom edge easily, and offers haptic feedback when removed or put back. The thicker profile of the S Pen makes it easier to hold and use. 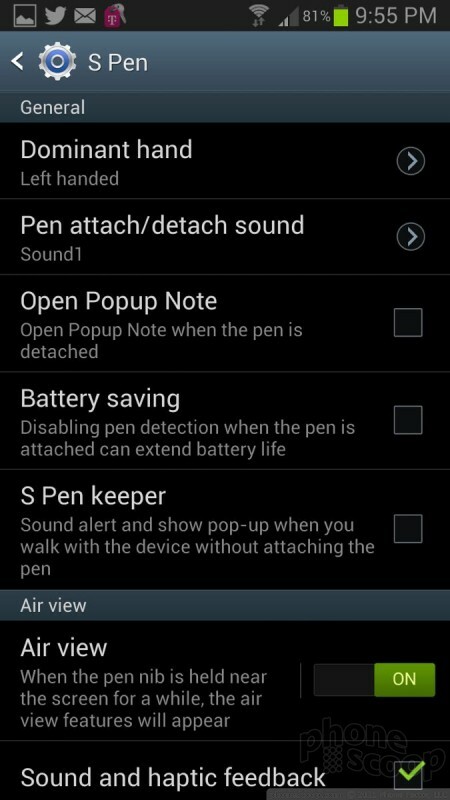 The S Pen now also has an on-screen pointer of sorts. 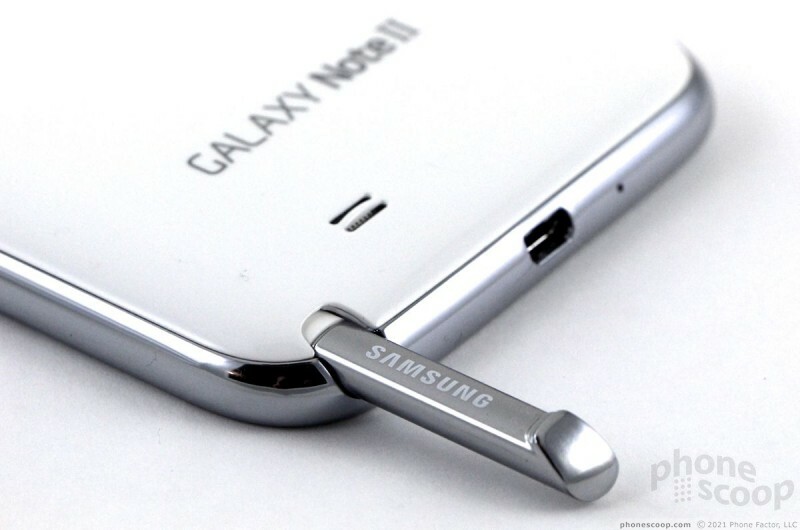 When you hover with the S Pen about one centimeter above the Note II's display, a tiny pointer appears on the screen. 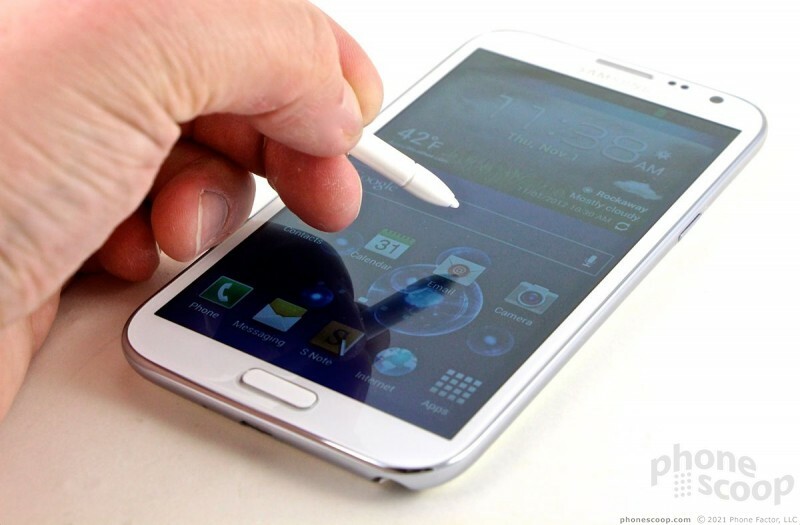 The pointer gives you an approximate idea of where the S Pen will land if you tap. The cool thing, however, is that the secondary action buttons works even when hovering. 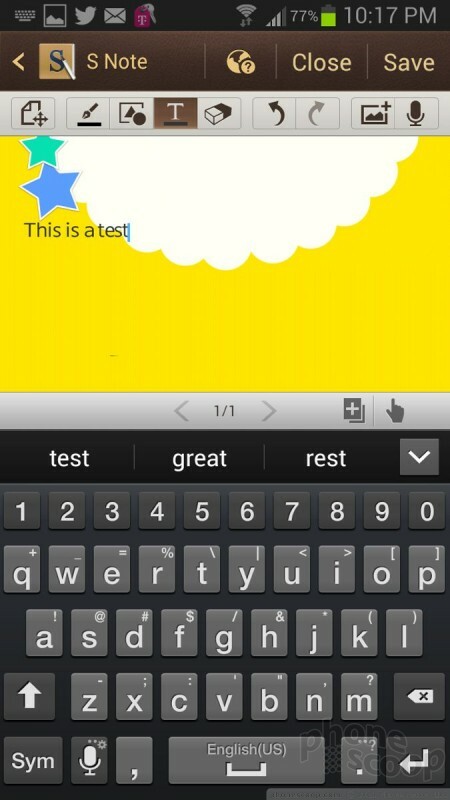 So, for example, you can hover over an app, press the button on the S Pen, and open a settings menu or similar. The one thing I think is insanely dumb is that the S Pen can't interact with the Back and Menu buttons on the phone itself. These capacitive buttons aren't part of the display, but it feels intuitive to use the S Pen to tap the Back button when you're browsing the device. It won't work. You have to use your finger. The S Note app really is useful if you're not averse to using the stylus. It is a full-fledged creative app that can be used to create all sorts of documents, including memos, letters, newsletters, cards, and many others. It offers some really cool tools, such as recognizing mathematical formulas, or shapes. For example, if you draw a circle, the S Note software will automatically clean it up and make it a true circle instead of your scrawled, uneven rendering. 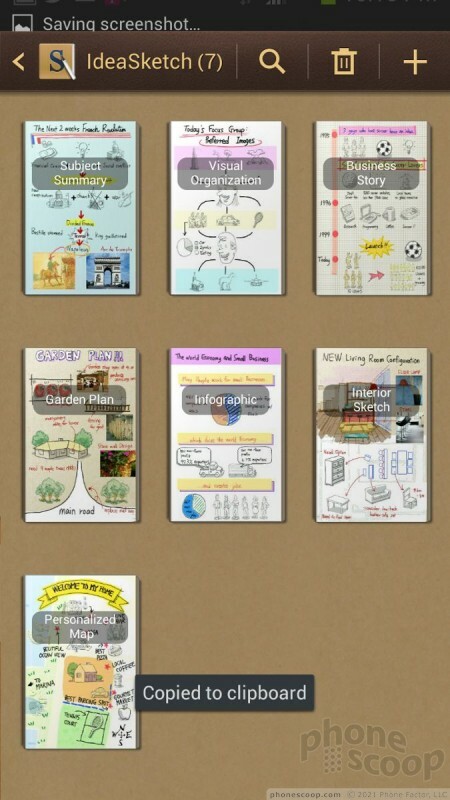 There are plenty of templates that make creating new documents a snap, and inserting text, images, and other content from other parts of the Note II is a breeze. 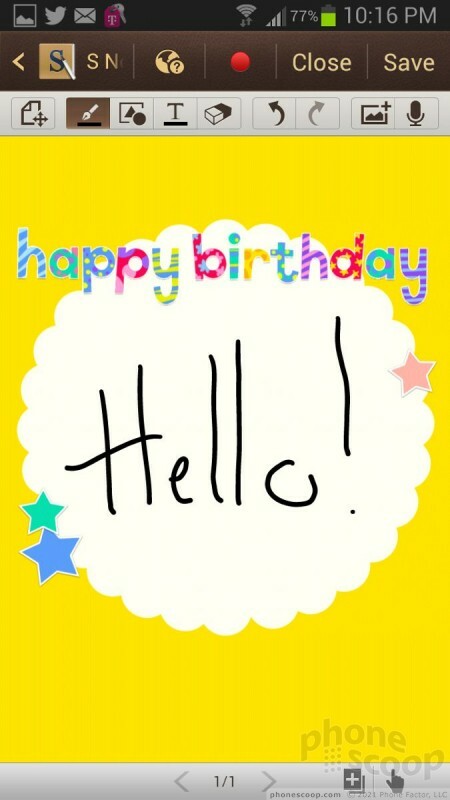 Notes can be multiple pages long, and S Note includes handwriting recognition software as well as access to the Swype keyboard. You can import clip art, or maps, you can skip the pen and keyboard entirely and dictate notes, and of course you can send the notes to others via email, social networks, etc. Like Apple's Siri, S Voice on the Note II is a voice-controlled assistant. Double tap the home key and S Voice launches, asking you what you want help with. You can search for contacts, dictate SMS messages, check the weather, see alarms, and so on. It definitely has limitations. You can't use it to start and address an email, for example, but you can dictate the text therein. You can have it start the media player, but not open the camera and take a picture. 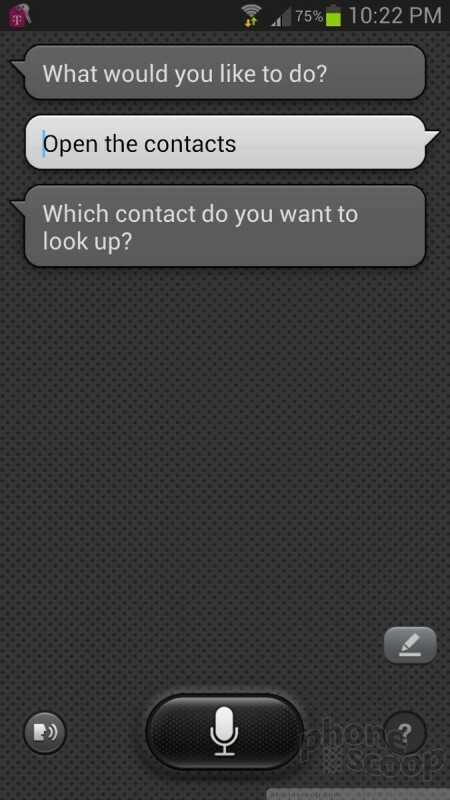 The GroupCast app allows one user to share their content with a group of other Note II (or GSIII) users. For example, say I choose to share a photo album with you. Not only can you see it on your device (this is all accomplished over Wi-Fi, by the way), but you can interact with it. Other participants can swipe through the gallery, which is cached locally on the participants' devices, as well as write notes on the images or other content being shared. It's pretty neat. The Note II also works with Samsung's TecTiles. TecTiles are programmable NFC stickers that will interact with the Note II. 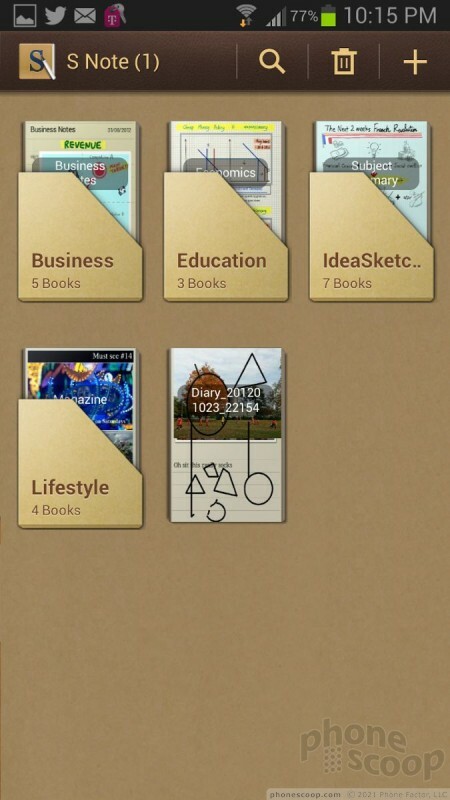 Using a separate app, Note II owners can set up each tag to perform one of about a score of actions. For example, use one at work to turn on the Wi-Fi radio and automatically connect to your corporate network. Or use one to initiate a phone call to your significant other when you get home. Programming the TecTiles is a cinch. Samsung is selling the stickers in packs of 5 for $15.